Heat is also an agent of change, making things malleable so they can be worked with. It might be to stretch it, to transform its shape, or to melt it down completely to start from scratch. And that brings us to the next part of the blacksmithing process. Once the blacksmith has heated the metal enough so that it is malleable, he hammers on it to create the shape he is looking for. This is not a split-second process. He heats, hammers, and shapes. Heats, hammers, and shapes. Over time, the metal begins to reflect the shape that the blacksmith desires. Paul tells us, “Now no chastening seems to be joyful for the present, but painful; nevertheless, afterward it yields the peaceable fruit of righteousness to those who have been trained by it” (Heb. 5:11). As I mentioned in the introduction, anger or vindictiveness isn’t the motivation behind trials and challenges. The article I referenced at the outset has the blacksmith talking about how many people assume it feels really good to pound out your frustrations on the metal. His response is really interesting. This part of the analogy rings very true as well. God doesn’t strike out in uncontrolled anger. That’s not why we go through trials. Instead, He very patiently and deliberately shapes us, with measured force based on the final shape He desires. The analogy of a blacksmith has a lot of similarities to the analogy of a potter that is used many times in the bible. One of the biggest similarities is that both metal and clay offer almost unlimited second chances. Unlike wood or stone, where there is no “undo” button in shaping, metal and clay are completely recyclable until they are quenched or fired to set the final shape. There are no true mistakes—if a piece is messed up, wait a little, then re-heat it and start again. “Plunging hot metal into water after it has been forged to shape [is called quenching]. It is important to judge exactly the right time to do this. If it is done too soon the metal may become brittle and shatter easily; but leave it too long to quench and the metal may be too soft to sharpen into an edge. Sometimes, it is necessary to re-heat metal to the correct temperature before quenching it.” (Source). Through trials, God is tempering us to withstand future challenges and tribulations, so that we are strong enough to overcome the trials of this life and hold fast to our crowns (Rev. 2-3). Just like the paragraph above indicates, He understands how to work with each of us, when we’re “at the right temperature” rather than when we might have gone too soft or too brittle, or in need of some extra work. And just like that bucket of cold water, it occasionally takes a shock to the system to achieve His purpose. James wrote to the brethren that they should “count it all joy when you fall into various trials, knowing that the testing of your faith produces patience” (James 1:2-3). The word translated “patience” here means endurance or constancy. Steadfastness. In other words, staying the course and holding up under adversity. Let’s go back to the blacksmith analogy. The smith is trying to make an instrument out of steel. Whether it’s a sword, a nail, or (on a big scale) the frame to hold up a skyscraper, the final product has to be almost indestructibly strong. Now the obvious parallel here with water is baptism, and I think that’s a piece of it. Although in this analogy, baptism doesn’t magically freeze us in our final shape with enough strength to withstand anything that comes our way. Instead, baptism is a beginning, a commitment to the process of being re-made. But we could still look at the plunge into water as providing the metal with greater strength and the ability to withstand adversity—exactly what God’s spirit does for us upon baptism. I go back to the question posed at the beginning: What is God’s intention for allowing His people to suffer trials and tribulations? 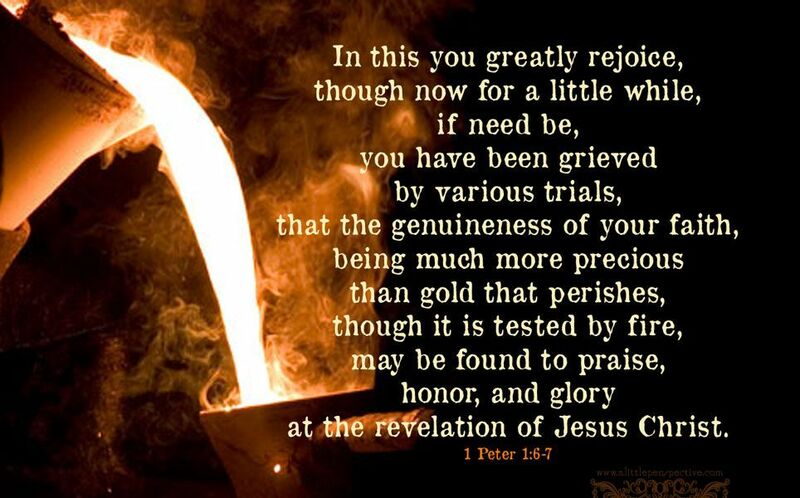 Peter sums up the purpose of the blacksmith’s fire, hammering, and quenching by telling us, “In this you greatly rejoice, though now for a little while, if need be, you have been grieved by various trials, that the genuineness of your faith, being much more precious than gold that perishes, though it is tested by fire, may be found to praise, honor, and glory at the revelation of Jesus Christ” (I Pet. 1:6-7). God is working with each of us, using fire and pressure to remove imperfections and shape us into His image (Col. 3:10). We can fight this process, requiring Him to continually apply more heat and pressure to get the desired result. We can become brittle and break. We can refuse to hold the shape He creates. Or we can submit to the heat that is applied in our lives, and become the work He desires us to be. That part of the process is ultimately up to us. I absolutely loved the insight of a black smith working on the intrusment . Powerful , thank God for you.